Helping personal injury victims for 25 years. When you are injured by someone else’s carelessness in the Commonwealth of Massachusetts, you may be wondering whether you should hire a personal injury lawyer, speak to the insurance adjuster, or sign any forms. The information on this website. An experienced personal injury attorney in your corner will thoroughly investigate your claim, establish the nature and extent of your damages, deal with the insurance company, and take much of the burden off your shoulders. 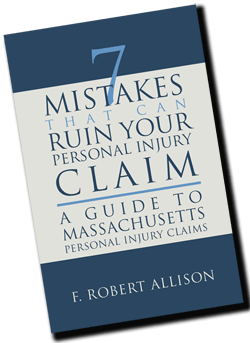 Massachusetts personal injury law provides that in order to prevail against the person who caused your injury, your personal injury attorney must prove liability, causation and damages by a ‘preponderance of the evidence’ (or in other words, when all of the evidence is weighed that the matter is more probably true than not.) 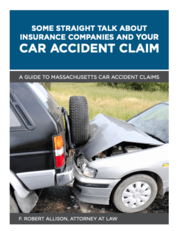 Take a look at this simplified guide to Massachusetts personal injury claims. Giving a recorded statement to the defendant’s insurer can harm your personal injury claim. The adjuster is on the lookout for information that he can use to impeach your credibility and pay you less money for your claim. When the adjuster takes your statement, he will be experienced, prepared, and have a plan after having investigated your claim. On the other hand, it is not likely you will be prepared and may be in pain or on medication. How much does a Massachusetts personal injury attorney cost? In personal injury claims, Massachusetts personal injury lawyers are required to sign contingent fee agreements with their client that provide, in part, that the attorney’s fee is contingent upon compensation to be paid for the recovery of damages and the client is not to be liable to pay compensation to the lawyer other than from amounts collected for him/her by the personal injury lawyer. How will I know how much my claim is worth? There is no special formula concerning the value of a personal injury claim. However, there are specific factors that are considered in determining the value of a personal injury claim. Your Massachusetts personal injury attorney will review these factors with you to ensure the integrity of your claim. Some of our case results. We will represent you in a manner that allows you to focus on your personal injury recovery while we work on your claim. We accomplish this through diligent investigation, research and evaluation and by keeping you informed, returning your calls promptly, and treating you with respect and honesty. 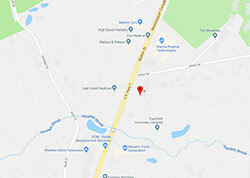 If you or someone you know was injured due to someone else’s negligence in Topsfield, Salem, Peabody, Danvers, Beverly, Lynn, or another part of Essex County, Massachusetts, contact our office to receive a free consultation to review your claim. Call 978-740-9433, email bob@frobertallison.com, or fill out our online contact form today. Attorney Allison always returned my calls promptly, settled my case quickly, and answered all my questions. In addition, his staff was always friendly and kind. I would not hesitate to recommend his services to a friend or family member.